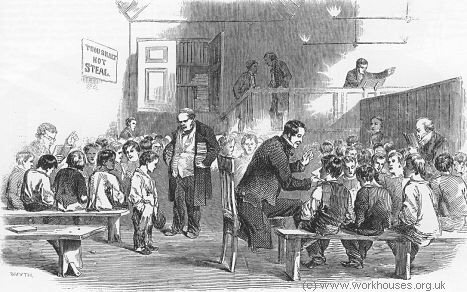 Prior to the Education Act of 1870, formal education in England and Wales was largely restricted to children whose parents could sending them to private fee-paying schools. However, a variety of eastablishments existed which provided basic education for children from poorer families. Charity schools, supported by public subscription, date back to at least the 17th century. A number were opened in the late 1600s in London, and the early eighteenth century, the Society for Promoting Christian Knowledge (SPCK) was active in their promotion. In York, the SPCK, in association with the archbishop, dean and chapter, and local corporation, established two schools in 1705: a Blue Coat school for 40 boys, and a Grey Coat school for 20 girls. The children were to be orphans or dependents of freemen with large families. In 1739 in London, CaptainThomas Coram established a foundling hospital and school at Bloomsbury Fields for the "education and maintenance of exposed and deserted young children" which continued in operation until the 1920s. Although Sunday schools may date back as far as the 16th century, the Sunday schools movement is often associated with Robert Raikes, a newspaper publisher, who popularized the idea. His interest led to the opening of a church-based Sunday school in Gloucester in 1780. With support from the Bishops of Chester and Salisbury, a London Society for the Establishment of Sunday Schools was established in 1785. By 1787, it was reckoned that there were 250,000 Sunday school pupils. By 1831, this had risen in England to over 1.25 million and by the mid nineteenth century around two-thirds of all working-class children aged between 5 and 15 were attending Sunday school. Dame schools were run by women of often little or no qualification who charged 3d or 4d per pupil a week and taught skills such as reading and writing to a rudimentary level. Dame schools were often held in corners of kitchens or in insanitary cellars while the "teacher" continued with other household work - they often served more as a child-care service than as a school. British Schools were introduced in 1810 by a non-denominational organization called the British and Foreign Schools Society to promulgate the work of the Quaker teacher Joseph Lancaster. The schools made use of "monitorial" system where older children taught younger ones under the supervision of paid staff. By 1851, around 1500 had been set up. Chipping Norton's 1854 British School, 2000. Members of the Church of England, seeing the success of Lancaster's schools, decided to set up a similar system for themselves with teaching centred on the Church Liturgy and Catechism. The National Society for the Education of the Poor in the Principles of the Established Church was formed in 1811. They invited Dr Andrew Bell, another proponent (and perhaps originator) of the monitorial system, to organise the creation of the National Schools system, which by 1851 numbered 17,000 schools. Walthmastow's 1819 National School, 2000. Below are some extracts from the 1839 'Rules and Precepts' for the Brooke and Kirstead National School in Norfolk. This large school opened in 1819 to serve the parishes of Brooke. Howe and Kirstead. In 1844, William Henry Banham was the master, and Louisa Rummer the mistress. Parents are earnestly requested to read the following Rules, and the Address which is appended to them, once a month and to call the attention of their children to the PRECEPTS and ADVICE contained in them. To which Attention of Parents is Particularly called. I. Parents, who wish their children to be admitted into these Schools must apply to one of the committee, at the school, on some Monday morning, by nine o'clock. No child can be admitted who has any infectious disease. II. When children are first admitted, their parents shall receive a copy of the rules and address, for which they shall pay one penny. III. The payment for one child shall be two pence per week, but if two or more children are sent from the same family, only a penny shall be required for each additional child. Those who write with pen and ink must pay a penny per week extra, and find their own copy books. IV. The children are to come with their hands and faces well washed, and their hair clean and neat, and never to be without pocket handkerchiefs. X. Every Saturday is a whole holiday, and there will be vacations in harvest and at Christmas and at any other time when the managing committee shall think proper. XVI. Though these schools are intended principally for the children of the poorer classes, yet small tradesmen and small occupiers of land may send their children on payment in addition to the usual weekly charge of 2s 6d quarterly, or Such Sum that may seem reasonable to the committee, and the visiting committee shall determine what parents shall be allowed this privilege. 1. To behave respectfully to the mistresses, managers, and visitors and to be "lowly and reverent to all their betters," both in the school, and whenever they meet them elsewhere. 2. To be kind to their school fellows and to all other children, and to avoid all quarrelling. 3. Never to cheat any one, nor to take another person's property, even in play; and never to play for money. 4. To use no bad language. 5. Never to mock cripples, or infirm persons, not to be rude to the old. 6. Never to be cruel to animals, nor unkind to any living creature. 7. To be dutiful and respectful to their parents and friends, endeavouring to assist them as far as they can. 8. To keep holy the Sabbath, and to behave with seriousness, attention and reverence in all places of public worship. 9. On all occasions to speak the TRUTH. 10. To come to, and go from school in an orderly manner, never to throw stones, or to loiter by the way. 11. To be quiet in the school, not to use any play things in school time, to keep their books neat and free from dog's ears, and not to climb upon the desks nor to scrawl upon or in any other way to damage the desks, forms or walls of the school-house. Ragged Schools developed from the work of John Pounds, a Portsmouth shoemaker who in 1818 provided a free school for the poorest children. Thomas Guthrie helped to promote Pounds' idea of free schooling for working-class children and started another "ragged" school in Edinburgh. A further school in Aberdeen was set up by Sheriff Watson. In 1844, Lord Shaftesbury formed the Ragged School Union which eventually established over 200 free schools. The Ragged School Union also established regular dinners for underfed children. Camberwell Ragged School Union Dinner, 1901. Non-denominational Board schools operated by a system of 2,500 School Boards. The Boards were elected by local ratepayers, and were innovative in that women were allowed to vote and stand for election. Boards had the power to levy a rate for setting up and running schools where voluntary provision was inadequate. The first Board Schools opened in 1872. 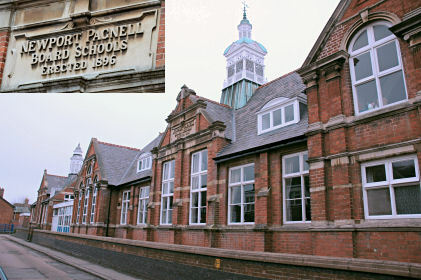 Newport Pagnell Board Schools, 2005. 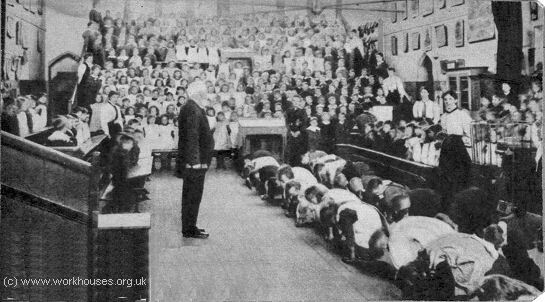 Elementary School - taking turns doing exercises for warmth in winter, c.1890. By 1880, school attendance had become compulsory for all children between 5 and 10 years of age. The leaving-age was gradually increased — to 11 in 1893 under the Elementary Education (School Attendance) Act, to 12 following the 1902 Education Act which abolished School Boards and replaced them with Local Education Authorities, then to 14 in 1918 under the Fisher Act. The 1944 Education Act raised the school leaving age to 15, and divided schools into primary and secondary. At the same time, state primary schools were made co-educational with previously separate boys' and girls' schools being merged.